Focus Time and Attendance software is the perfect way to plan your work schedules for months in advance, removing the tedious administrative duties associated with them. 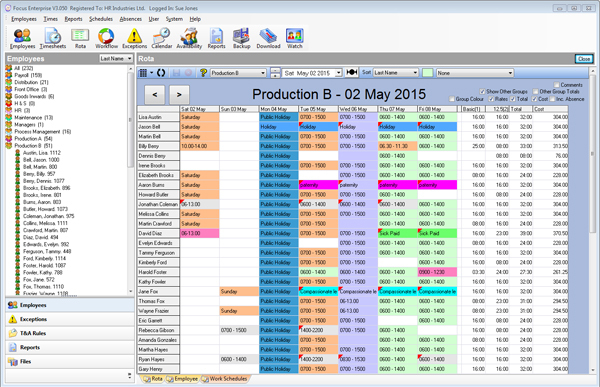 The system enables you to set up different rules to govern varied shift patterns; one set, say, for clerical staff working 9-5 and a different set for your factory floor workers. The rules can also incorporate overtime, absence, breaks and more on a company-wide, section-wide or individual basis. You can set up as many weekly rules as you need to cover weekend work, night shifts and bank holidays – virtually any changes you need to track attendance and pay your employees.